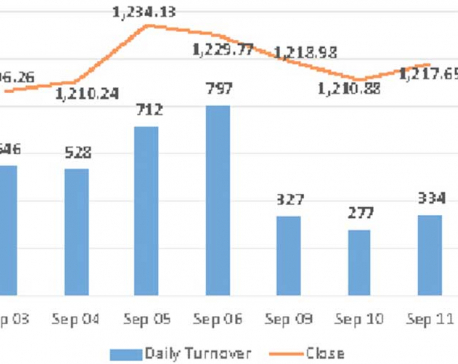 KATHMANDU, Sept 26: Significant strength was visible in the bourse since the beginning of Tuesday's trading session. Subsequently, the benchmark Nepal Stock Exchange (Nepse) traded 17 points higher in the afternoon. Despite the index pulling back slightly mid-session, it further added to its initial rally in the remaining session to close fairly higher. The benchmark index posted a notable gain of 22.37 points or 1.78 percent to close at 1,280.05 points. Nepse hit a fresh 3-month high on the heels of the day's broad rally. Further, the surge was reinforced by active market participation as the total turnover crossed Rs 1 billion mark after five months. Investors appear optimistic of late as the market has gradually started to recover from some of its lowest levels of around 1,200 points mark. Market bellwether banking stocks led the gains on Tuesday. Its sub-index jumped 2.67 percent. Besides, all other sub-indices, barring the 'Others' sub-index, closed the day in green. Significant strength was also visible among development bank stocks as the group's sub-index climbed 2.49 percent. Correspondingly, sub-indices of Trading, Hotels and Non-Life Insurance segments rose over 1 percent each. Further, In terms of transactions, banking stocks were predominantly preferred by investors. Shares of Prabhu Bank Ltd posted the highest turnover of over Rs 85 million, followed by that of NIC Asia Bank Ltd with a total transaction of over Rs 62 million. Nepal Investment Bank Ltd, Janata Bank Nepal Ltd's scrips were also actively traded with turnovers of over Rs 54 million each. Other top turnover stocks for the day include shares of Nepal Bank Ltd, NMB Bank Ltd and Sanima Bank Ltd.
Shares of Bhargav Bikas Bank Ltd led the day's rally with a gain of almost 10 percent. Second on the list of gainers, shares of Sunrise Bikas Bank Ltd rose 8.57 percent. Shares of Prabhu Bank Ltd and Shine Resunga Development Bank Ltd also climbed 7.36 percent and 6.21 percent, respectively. Similarly, Nepal Community Development Bank Ltd's share price added over 6 percent after the Class' B' bank announced 6.42 percent cash dividend and 1 percent bonus shares to its shareholders. In contrast, shares of Gurkhas Finance Ltd suffered the most with a drop of 4.54 percent in the session. Similarly, weakness was visible among shares of Synergy Power Development Ltd and Civil Laghubitta Bittiya Sanstha Ltd as their respective prices skidded over 3 percent each. Besides, other losing securities include Api Power Company Ltd, Citizens Mutual Fund-1, Rairang Hydropower Development Bank Ltd and Dibyashwori Hydropower Ltd which tumbled almost 3 percent apiece. In the news, Oriental Hotels Ltd proposed 26.32 percent bonus shares to its shareholders. The payout includes 15 percent bonus shares and 11.32 percent cash dividend. Meanwhile, Mero Microfinance Bittiya Sanstha Ltd has decided to float 100 percent right shares to its shareholders. ARKS technical analysis indicates the index breaching its short term resistance of 1,170 points. Consequently, the market has further added to its recent rally. Moreover, bulls still appear dominant at present with Moving Average Convergence/ Divergence (MACD) trending firmly in the positive territory. If the index finds support at the current level, it can be expected to stretch to 1,300 points in the short run.